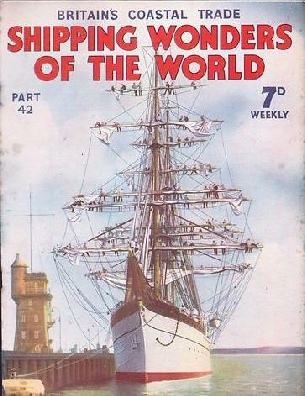 Part 42 of Shipping Wonders of the World was published on Tuesday 24th November 1936. It included a centre photogravure supplement featuring the hulks of old ships, which formed part of the article The Glory is Departed. This week’s cover shows the Gorch Fock, the training ship of the German Navy, at Kiel. The Gorch Fock was built at Hamburg in 1933 and has a displacement tonnage of 1,486. Her principal dimensions are 200 feet by 39 ft 4 in by 15 ft. She is equipped with auxiliary diesels of 500 horse-power. The geographical position of the British Isles and their proximity to the mainland of Europe have given rise to an important coastwise trade, not only within British waters but also to neighbouring European coasts. The coastal trade of Great Britain has been described as the Cinderella of the transport industry. This chapter is by B. Lavis. Extracts from the log of the late Captain James William Holmes, concluded from part 41. Captain Holmes’s reminiscences were collated by his daughter, Mrs Nora Coughlan, and later published under the title Voyaging: Fifty Years on the Seven Seas in Sail (London, 1965). Captain Holmes’s papers are now held in the State Library of New South Wales. GALATA BRIDGE spans the harbour of Istanbul, which consists of three sections - the Outer Port, Galata Port and the Inner Port. This photograph was taken from the deck of the Champollion, a Messageries Maritimes vessel of 12,546 tons gross. Built in 1924, she has a length of 495 ft 1 in, a beam of 62 ft 7 in and a depth of 40 ft 6 in. 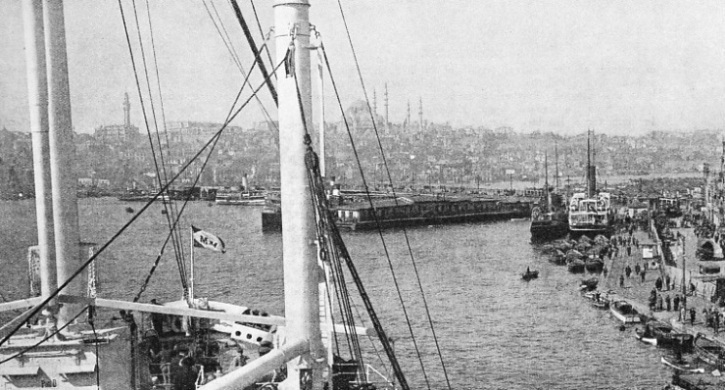 At the quayside on the right is a Turkish vessel of 929 tons gross, the Bursa, built in 1900. She has a length of 210 ft 7 in, a beam of 30 feet and a moulded depth of 14 feet. 7 in. 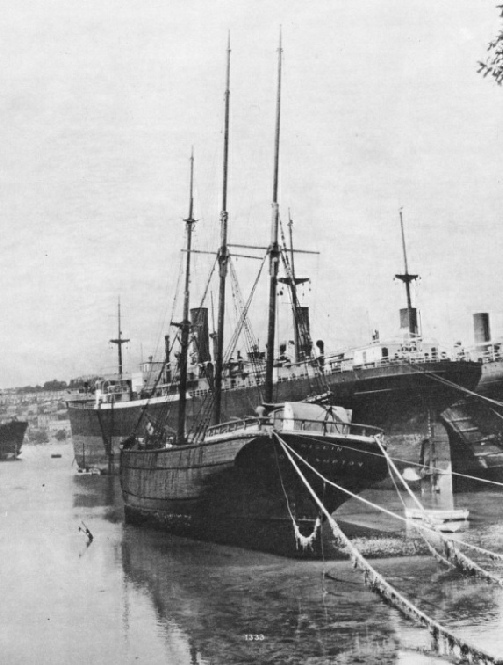 In September 1902 the Brutus went ashore in Table Bay. She was refloated and became a hulk. 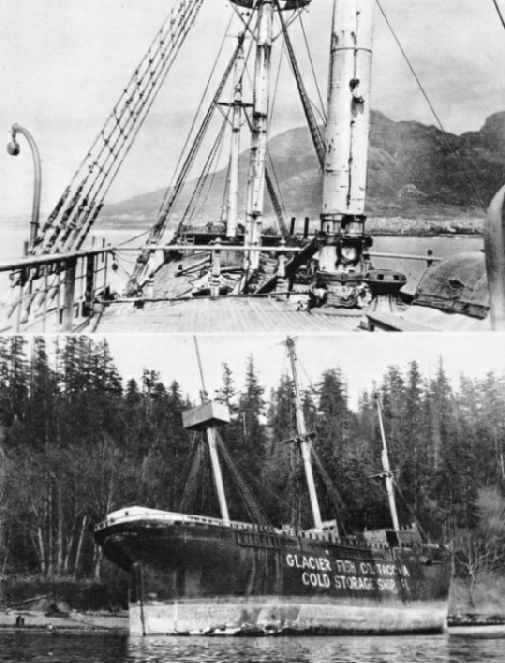 A COLD STORAGE SHIP for the Glacier Fish Company, of Tacoma, Washington, was formerly the Glory of the Seas. One of the best examples of Donald McKay’s work, the Glory of the Seas, 2,103 tons gross, had a length of 240 ft 3 in, a bema of 44 ft 1 in and a depth of 28 ft 4 in. 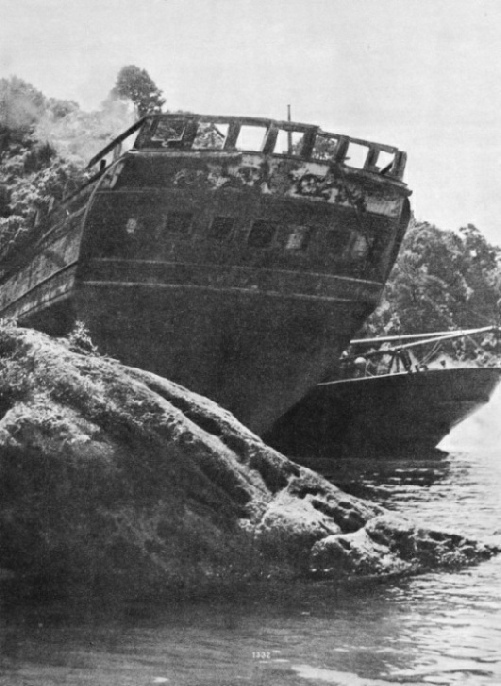 She was built at Boston in 1869 and, after a wonderful career, suffered this ignominious fate. In 1923 an effort was made to re-rig and preserve her, but she was deliberately burned so that her valuable copper fittings could be easily recovered. Probably the most effective of all methods of attack in naval warfare is the use of weapons such as the torpedo, the mine and the depth charge, which are particularly dangerous because they strike below the water-line. Nearly seventy years ago the torpedo was invented by a British engineer, Ralph Whitehead, and an Austrian naval officer, Captain Luppis. Soon after its invention it was used by the British Navy, and has been used ever since. Whitehead’s original torpedo was 14 feet long and had a total weight of about 5 cwt. The present-day torpedo is much bigger altogether. The latest Italian torpedo is typical. Its length is 23¼ feet, and its weight 2 tons. It is difficult to give exact figures, as Government departments are reticent ain these matters. It is, however, not so much in the exact details of size and efficiency of these undersea weapons that we are interested. We read quite enough abut tanks and torpedoes, guns and gas in our daily papers. What is particularly interesting to us is the more scientific aspects of torpedoes and mines, and it is this aspect that Hector Bywater deals with in this chapter, which is the eleventh article in the series The Navy Goes to Work. There is another article on the Design of the Torpedo in part 51. This type of vessel is known as the “flat iron” collier. She has a low superstructure and a hinging funnel, so that she can navigate under the London bridges. The drawing above shows the Fulham, ordered by the Fulham (London) Borough Council. Under the management of Stephenson Clarke and Associated Companies Ltd., of London and Newcastle-on-Tyne, she operates between Newcastle and the Council’s generating station at Fulham. When the construction of the new Fulham generating station was decided upon, with its eventual 310,000 kilowatts of installed plant, it was decided also that the most economical means of bringing coal to the station was for the borough to have its own fleet of colliers. The Fulham is the first of a trio of such vessels. The conditions in which she has to operate have necessitated the most careful design. She has to navigate the arches of the numerous low-span bridges across the River Thames before reaching her destination, and for this reason the mast and funnel are arranged to be lowered easily and rapidly. Similarly, all deck-houses and superstructures have had to be made of navigable limits. The vessel has to steam up the River Thames loaded to the Fulham power station on any tide during the year and then, after having been discharged in about six and a half hours, she has to go down the river on the next flood tide. The cargo holds have therefore been designed with sloping wing ballast tanks, so that the cargo flows by gravity to the discharging grabs, thus providing expeditious handling of the coal. 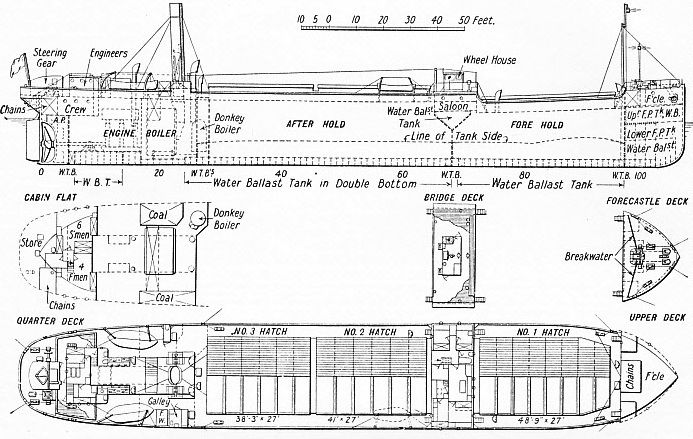 The main deck is continuous all fore and aft, with stores and crew accommodation below deck fore and aft. Accommodation is provided for her crew of sixteen men, this space being well fitted and ventilated. The main propelling machinery consists of one triple-expansion surface-condensing engine with maximum continuous rating of 950 ihp. It has a maximum propeller shaft speed of 82 revolutions, giving a speed of 10½ knots in the fully loaded condition. The steam generating plant consists of one cylindrical assisted-draught boiler, which has an external diameter of 16 ft 9 in, and a length of 11 feet. This boiler is provided with three furnaces. The total grate area is 60 sq feet and the heating surface 2,800 sq feet. The boiler is capable of applying, at maximum continuous rating, 14,500 lb an hour ant 200 lb per sq in pressure. The Fulham has a deadweight capacity of 2,390 tons. She has a length of 238 feet, a beam of 28 ft 1 in and a depth of 18 ft 8 in. She has a draught of 15 ft 10 in forward and 16 feet aft. 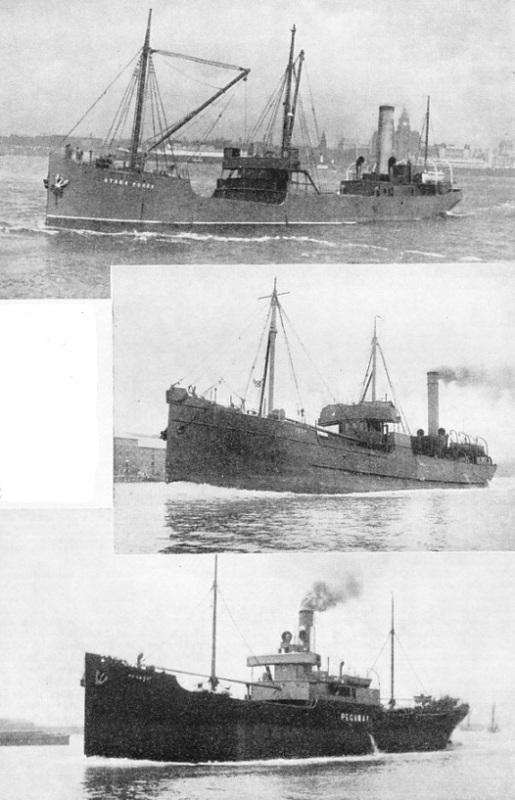 This is the thirty-second article in the series on Merchant Ship Types. Beneath the dirty paint of many hulks to be seen in various parts of the world are concealed the beautiful lines of proud sailing ships that were once undisputed mistresses of the seven seas. Now that the days of sail are gone for ever, it is fitting that a record of such ships should be preserved for our children and their children. It would not be right, however, to deal only with the glories of those ships. The subject has a darker side and in this chapter Frank Bowen describes the end, sometimes degrading, which befell the sailing ships. Some of them were lost at sea - a tragic, but fitting end. Others were condemned to the breaker’s yard. Others went to the timber trade, became coal hulks or gunnery targets. The article includes a photogravure supplement of four plates. IN THE RIVER MERSEY the Stock Force, 983 tons gross, passes Liverpool Landing Stage. The Stock Force is registered at Whitehaven, Cumberland, and is owned by the West Coast Shipping Co. Ltd. She has a length of 203 feet, a beam of 33 ft 11 in and a depth of 13 ft 1 in. She was built in 1917 and served as a Q-ship during the war of 1914-18. WITH MACHINERY AFT, the Test, a well-deck vessel of 530 tons gross, was built in 1890 and in 1936 was still actively engaged. Owned by Monroe Brothers Ltd, and registered at Aberdeen, the Test is 175 feet long, with a beam of 26 ft 6 in and a depth of 10 ft 1 in. BUILT IN 1924, the Pegaway, 1,826 tons gross, has a length of 260 feet, a beam of 39 ft 2 in and a moulded depth of 21 feet. She is owned by the Hill Steam Shipping Co. Ltd., of Newcastle-on-Tyne. One of the most important natural waterways in the world is the series of straits dividing Europe from Asia Minor - the Dardanelles, the Sea of Marmara and the Bosphorus. They link Istanbul and the Black Sea wheat and oil ports with the Mediterranean and the trade routes of the world. Throughout the ages the Dardanelles have been a thorn in the flesh to diplomats, a problem to naval and military strategists - and a challenge to swimmers. The Dardanelles, known to the ancients as the Hellespont, are a part of the straits dividing Asia from Europe. The Dardanelles are rich in historic associations and they have, too, a potential wealth of a more material kind. The shores of the Black Sea, the entrance to which they command, are fertile and give access to rich oilfields. In this chapter Sidney Howard contributes another article in the series on World Waterways. CONVERTED INTO A LANDING-STAGE at Picton, New Zealand. 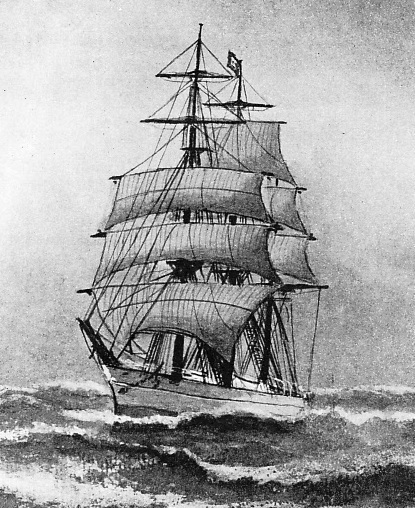 The Edwin Fox, 836 tons, was built at Calcutta in 1853. She had a length of 144 ft 10 in, a beam of 29 ft 10 in and a depth of 23 ft 4 in. She was sold into the New Zealand emigrant trade and, when dis-rated, was fitted with refrigerating machinery and was used as a cold store for meat. She later became a hulk, and finally was used as a landing-stage, where her picturesque stern windows decoration and poop rail are still to be seen. THE SHIP THAT BECAME A DRY DOCK. In 1829 the Canton was sunk at Limehouse, London, to form a small dry-dock. 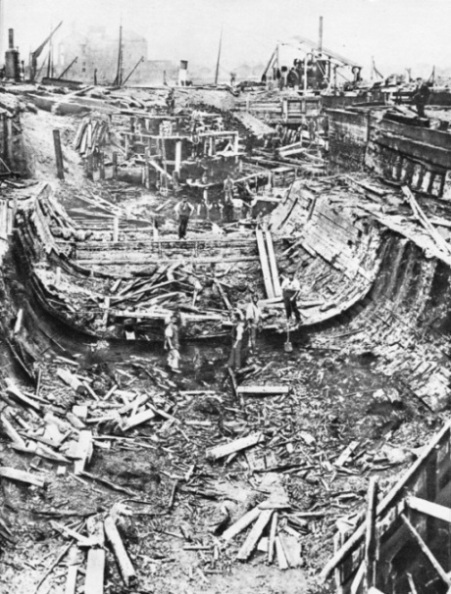 Her stout timbers remained in such good condition that in 1898, when it became necessary to enlarge the dock, the demolition of the old ship proved difficult. The Canton was an East Indiaman of about 1,200 tons, built in 1790 and discharged from the East India Company’s service in 1811. She mounted thirty-two guns and had a crew of 130. 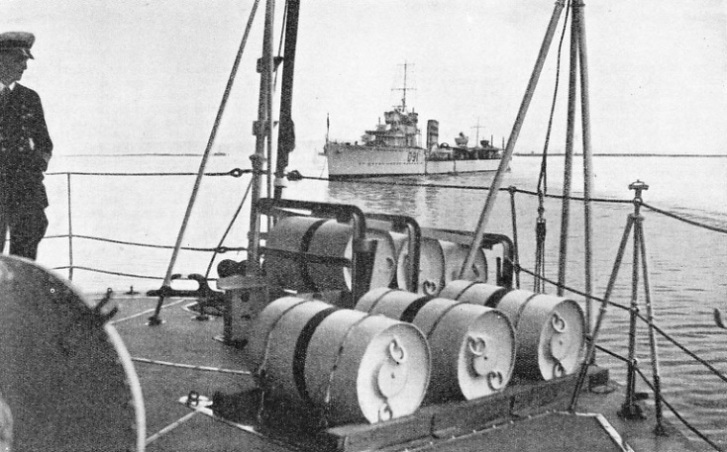 DEPTH CHARGES on the deck of HM flotilla leader Kempenfelt. Specially designed for use against submarines, the modern depth charge is a metal cylinder 20 in long and 18 in in diameter. It contains 300 lb of TNT (trinitrotoluene) and will disable a submarine that is caught within 70 feet of the explosion. The Kempenfelt, built in 1933, has a displacement of 1,390 tons, and her geared turbines of 36,000 horse-power give her a speed of over 35 knots. In the background is the destroyer Viceroy, 1,120 tons displacement. Transatlantic records have been broken by the Rex and the Conte di Savoia of the Italia Line. These two vessels are the largest and fastest of the Italian luxury liners which ply between New York and the Mediterranean. We have dealt with French, American, German and British liners, and now it is the turn of Italy. 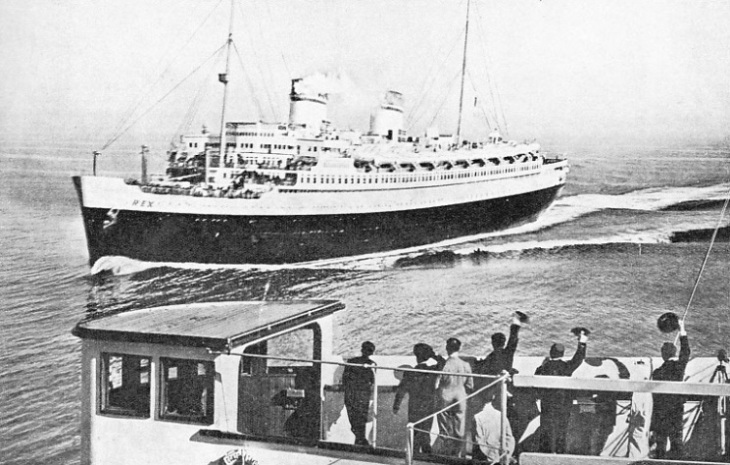 The Rex and the Conte di Savoia were built for the purpose of winning for Italy the Blue Riband of the Atlantic. This chapter is by A. P. Le M. Sinkinson, and is the eleventh article in the series on The World’s Largest Ships. The last of the great naval victories of Lord Nelson took place off Cape Trafalgar on October 21, 1805, and decisively established for Great Britain a sea supremacy that was not challenged for more than a century. This chapter is by Lieut.-Com. E. Keble Chatterton and is the fifth article in the series on Decisive Naval Actions. The article is concluded in part 43. 2 in, a beam of 37 ft 1 in and a depth of 21 ft 7 in. The illustration is from the painting by Captain Homes. TOWED TO HER LAST BERTH, HMS Grampian, an 81-guns warship built in 1860 as HMS Gibraltar, was for many years used as a training ship at Belfast after she had been taken from the active list. 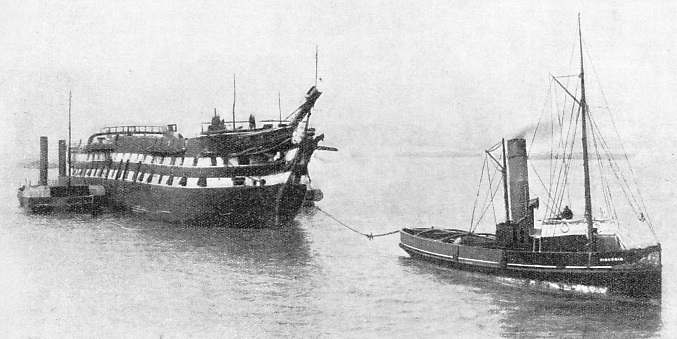 In 1899 she was towed to Plymouth, and later to Charlton, on the River Thames, where this photograph was taken before she was broken up. Her broken back is indicated by the curve in the lines of gun ports. 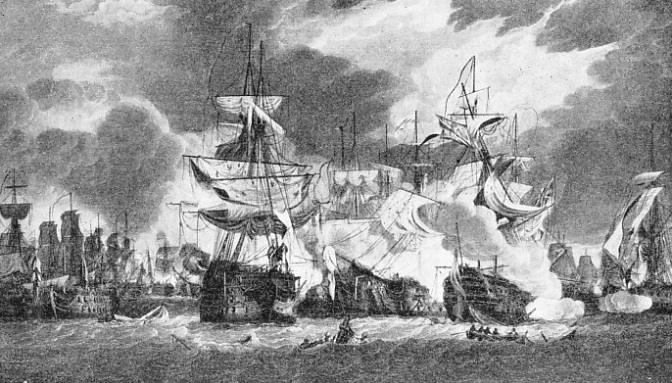 CLOSE-RANGE FIGHTING developed when the Victory, Nelson’s flagship, had broken the line of the Franco-Spanish fleet at the battle of Trafalgar. This illustration, the original of which dates from 1807, shows HMS Neptune in the left foreground. Between her and the Santisima Trinidad (right foreground) are concentrated the Fougueux, HMS Temeraire, the Redoubtable and HMS Victory.